We all know what swimmers posture looks like but how can we actually describe it? 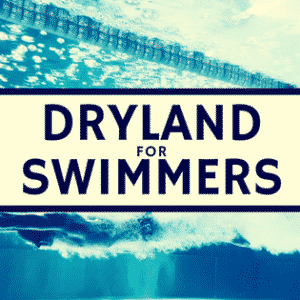 Characteristics include forward head, rounded upper spine (kyphosis), elevated and protracted scapulae, anteriorly positioned humeral head, highly developed upper trapezius, and palms facing posteriorly in standing posture (The Ultimate Guide to Swimmers Posture). The connection between posture and injury is undoubtedly controversial. 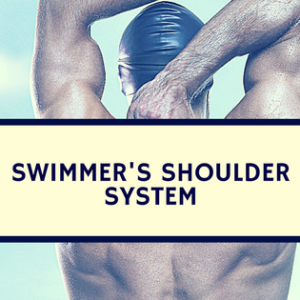 Many swimmers have great posture and get injured; many swimmers have horrible posture and don’t get injured. Pain is multifaceted and should not be seen as a direct correlate to biomechanics, especially when discussing static posture. (A Swimmers Guide to Pain) That said, given the unique and repetitive demands of swimming biomechanics, it must not be ignored in the swimming context. Recent literature has shown a connection between posture related issues and swimming injury, but there is insufficient evidence to attribute causation (also, these studies were female-only). Yet with swimmers posture so common with logical mechanisms tying it to common problems (impingement, instability), it deserves attention in coaching and assessment. Swimmers posture can be adaptive to accommodate the unique biomechanics of the stroke, particularly the catch in freestyle and fly and the pull in breaststroke. But this posture can also inhibit other aspects of the stroke, most notably the ability to flex the shoulder (raising the arm toward the sky). 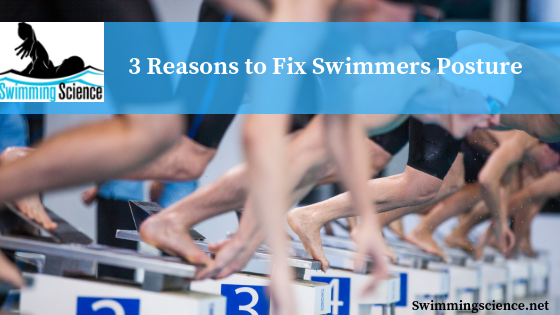 If you read the recent catalogue of stroke flaws compiled by Virag et al (2014) you’ll note that certain common faults can be directly or indirectly traced to swimmers posture. Consider the elevated head position, the most commonly observed flaw in the study. One reason why this flaw may develop is that swimmers posture may deprive swimmers of thoracic spine extension, causing a compensation in which the swimmer “borrows” additional extension from the neck (hence, the forward looking head position). This relationship is not provable, but it is worth consideration when teaching the stroke, especially if the swimmer seems physically unable to achieve the desired body alignment. Many years ago, Dr. Janda described the common cycle of muscle imbalances resulting from postural changes, best known as “upper crossed” and lower crossed” syndromes. Now, this concept has not been proven and many people decry it as nothing more than conjecture, but it is a useful framework to consider the implications of certain joint positions. Most would agree anecdotally that the muscles described as inhibited in Janda’s “upper crossed syndrome” are the same muscles commonly observed to be relatively weak, most notably the lower traps and rhomboids for swimmers. Again, posture should not be the primary goal of any strength program, but when we consider the rates of dryland injury repeatedly shown in the literature, posture should not be ignored. As noted, it is possible that swimmers posture could be positive sport-specific adaptation, much like shoulder asymmetries in throwing athletes or joint hypermobility in gymnastics and dancers. A rounded upper back could assist curling into a ball for flip turns and an elevated scapula may assist a high elbow catch. We definitely should not take the view that everyone who presents with swimmers posture must be fixed. But we should be cognizant of what swimmers bring to the pool (and the gym) before movement begins. 1) Tate A, Turner GN, Knab SE, Jorgensen C, Strittmatter A, Michener LA. Risk factors associated with shoulder pain and disability across the lifespan of competitive swimmers. J Athl Train. 2012 Mar-Apr;47(2):149-58. 2) Harrington S, Meisel C, Tate A. 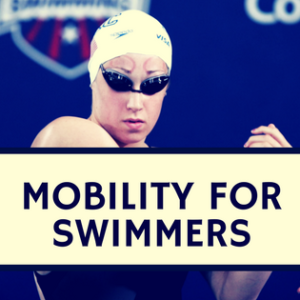 A cross-sectional study examining shoulder pain and disability in Division I female swimmers. J Sport Rehabil. 2014 Feb;23(1):65-75. doi: 10.1123/jsr.2012-0123. Epub 2013 Aug 12. 3) Virag B, Hibberd EE, Oyama S, Padua DA, Myers JB. Prevalence of freestyle biomechanical errors in elite competitive swimmers. Sports Health. 2014 May;6(3):218-24. doi: 10.1177/1941738114527056.